Industrial Hygiene is the science devoted to the anticipation, recognition, evaluation, and control of factors and stresses (arising in or from the workplace) which may cause sickness, impaired health, and wellbeing or significant discomfort and inefficiency among worker or among the citizens of a community (ACGIH). Although the definition is modern the concept has existed since antiquity. In the fourth century B.C., Hippocrates observed lead toxicity in miners. In the first century A.D., Pliny the elder noted health risks to those working with zinc and sulfur. He devised a face mask to protect worker from exposure to dust and lead fumes. Gulen a second century AD physician accurately described the pathology of lead poisoning. In 1788 the British Parliament passed the Chimney-Sweepers Act as a result of work by Percival Pott which linked soot to cancer and other health effects. In the U.S. the Occupational Safety and Health Act of 1970 was the landmark legislation related to safeguarding worker health. Since 1970 many regulations and requirements have been developed which positively impact worker health. A worksite analysis is the first step an industrial hygienist uses to determine the sources of potential problems. During the analysis exposures, problems, and, risks are identified and measured. Appropriate conative actions are recommended. Engineering, work practice, and administrative controls are the primary means of reducing employee exposure. Engineering controls minimize exposure by reducing or removing the hazard at the source or isolating the worker from the hazard. Work practice controls alter the manner in which a task is performed. Administrative controls include controlling exposure by scheduling production and tasks in ways that minimize exposure levels. When controls are not feasible or will not lower exposure to an acceptable level personal protective equipment may be used. Industrial hygienists are trained to recognize and evaluate on the job hazards Major job risks include air contaminants and chemical, biological, physical, and, ergonomic hazards. Air contaminants are either particulate or gas and vapor. 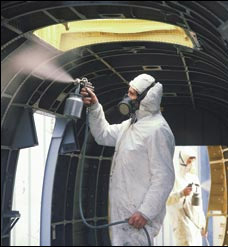 Particulates include dust, fumes, mists, aerosols and fibers. Gasses expand to occupy the space in which they are confined. Vapors are the volatile form of substances that are normally in a solid or liquid state at room temperature and pressure. Chemical hazards are probably the most commonly encountered hazards on campus. They exert their toxic effects by inhalation, absorption, or ingestion. Information can be obtained from the Safety Data Sheet for the chemical or product in question. Biological hazards include bacteria, viruses, fungi, and other organisms that can cause acute and chronic infections by entering the body. Laboratory and medical personnel, those who work with animals and occupations where personnel may be exposed to body fluids are considered at risk. Physical hazards include excessive levels of ionizing, monionizing and electromagnetic radiation, noise, vibration, illumination, and temperature. Personnel who work in labs, offices, and facilities may be exposed to physical hazards. Ergonomic hazards can be avoided by the effective design of a job or jobsite and better designed tools and equipment. By through worksite analysis controls and work practices can be developed which will reduce the risk of injury related to ergonomics. The University has an industrial hygiene program that performs worksite analysis , evaluates findings and recommends connective action. IH services are provided in many cases without request but as a function of solving the problem at hand. If you believe these services are needed in your area contact EHS.